Ballpark Basics: An island oasis in Central PA. 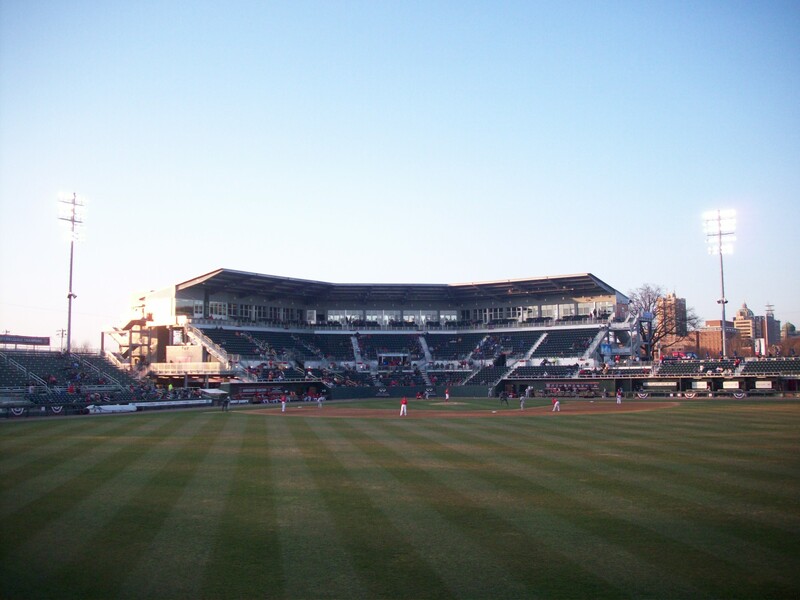 Ballpark Breakdown: A short walk from downtown, Metro Bank Park is located on scenic City Island. Walking across Walnut Street Bridge, (built in 1890 it is the oldest bridge surviving bridge over the Susquehanna), open only to pedestrians, gives you a great view of the exterior of Metro Bank Park. The bridge is lit once the sun goes down, and the setting is so picturesque that you will pass families and couples out just for a nice walk. Baseball and City Island have a long history together. Teams started playing on the island as far back as 1907. However, baseball is not the only sport on City Island. There are volleyball courts, a soccer field, softball fields as well as jogging and bike paths. This current team began play as an affiliate of the Pittsburgh Pirates in 1987, but has traded allegiances and now is the Double A affiliate for the Washington Nationals. With that, you would think that the Senators’ name is a nod to Washington’s former team. However, the Senators moniker has been around since 1924, long before they became a farm team for Nats; and actually stems from the team being located in the state capital, the home of the Pennsylvania legislature. Take a set of stairs up to the main entrance in the left field corner. Here you will find a large deck area with local businesses set up. To the left the fully stocked team store. 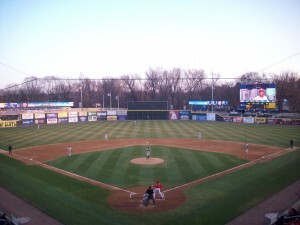 The Boardwalk runs behind the outfield fence and, we’re sure, has a much different atmosphere during the summer months. While this area was mostly desolate on our visit you can see how once the season warms up this area is a very popular part of the park. With a wide walkway dotted with beer and concession stands along with seats lining the field this is a great place to congregate and get a different view of the field. 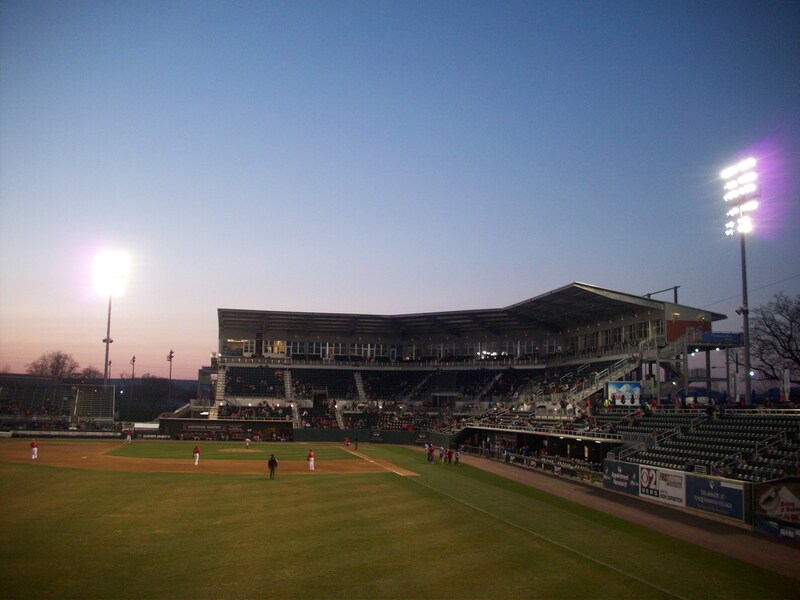 You have the Susquehanna River flowing by you on one side with the ballfield on the other. There is a large grandstand that spans the basepaths. Right above the grandstand you will find the suites where, on the night we were there, people stayed in to get out of the cold. A large set of bleacher seating is set up down the first base line with the right field corner area covered by a tent for a picnic area. The most interesting seating area is the dugout suites. Situated just past the visitors dugout there are three suites that give you a field level view of the game. 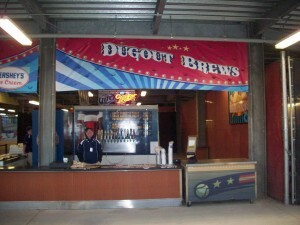 As you walk down the the left field concourse you will notice the kids area beneath you. Tucked under the grandstand and concourse down the third base line there are multiple inflatables and games for the kids. This area. Since this area is surrounded by concrete with almost no view of the game it can give you an almost claustrophobic feel. However, we are sure parents are happy that there won’t be any stray foul balls careening into this area. Central PA has it’s fair share of local breweries and Metro Bank Park does not disappoint. On top of the Dugout Brews concession stand underneath the main grandstand you can easily find local offerings from Appalachian Brewing Co, Troegs and Yuengling. We were there for opening weekend and spring hadn’t yet graced the Mid-Atlantic with its presence. The bunting was hung for Opening Day but the leaves had not yet sprouted on the trees and the temperature hovered around freezing. Being surrounded by water allowed a nice strong breeze that we are sure is appreciated on hot summer nights, but was far from ideal that evening. On the flip side, the cold weather did help with one annoyance that can plague the park during the summer months; the bugs! So pick your poison, multiple layers or bug spray, because these are just minor detractors for a unique park. Add the majestic Susquehanna flowing by as you catch nine innings, Metro Bank Park is definitely worth a visit. This location is actually made up of three floors, one holds the restaurant and a large bar area, one contains the main offices, and the other, known as the Abbey Bar, is an area where bands perform – usually with a cover charge – several nights a week. The first floor is the main one, and probably where you will hang out unless you’re there to catch a show. There are high ceilings, with large flags representing the countries whose style of beer is brewed at ABC. 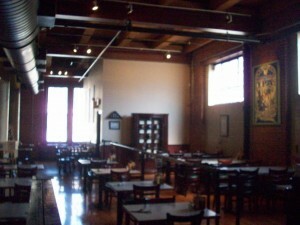 Booths and tables are all around, and the far back corner houses a large z shaped bar. A glass window partitioning off the stainless steel brew tubs from the rest of the place, giving pretty much any seat on this floor a view of the behind the scenes brewing – which also explains why you are hit with that malted brewery smell the second you walk in. At any given time they have over a dozen beers on tap, and their flight comes with seven of the regulars and one seasonal. Pennsylvania is currently working to overcome some of their more convoluted beer laws (like you can only buy entire closed cases from distributors and stores, nothing smaller). 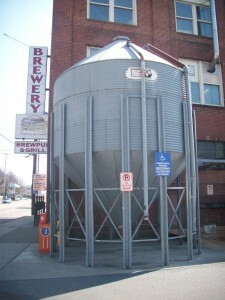 But since they are the brewer, and a restaurant their license allows them to sell fresh beer – bombers, 6 packs – including mix your owns – and 12 packs. 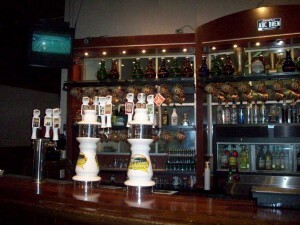 Several styles of growlers are also available for purchase. We suggest you take them up on one of these options; for while their distribution touches the states surrounding PA, it is fairly limited as their priority has to be keeping their 5 locations stocked for the visiting patrons. Water Gap Wheat Ale– (ABV 4.5/15 IBU) This is an unfiltered beer, but it doesn’t look it. Yellow, dry and carbonated. The Water Gap was served with a lemon wedge, and although this overpowered the aroma, as Jim put it “you’re lucky the lemon is there” since the palate is extremely light, and somewhat watery. The carbonation is really the only sensation you get. Mountain Lager (4.8 ABV/24 IBU) – Golden hued with visible carbonation, although not as much as the Water Gap Wheat. This lager is brewed in the Dortmunder style, and serves as a nice session beer, with a hint of hops in the palate and faintly in the bouquet as well it ends tingly and crisp. Purist Pale Ale (5.0 ABV/32 IBU) – The Purist pours brown with orange jewel tones like a weak iced tea. Not much aroma here, just a light, earthy dry smell and a touch of nut. The flavor that is similarly lighter, but in a easy-to-drink way, with a flavor that starts malty and ends with a hoppy spike. Jolly Scot (5.5 ABV/18 IBU) – This sienna brown hued beer smells of caramel malts and has a smooth, creamy mouthfeel with a punch of flavor when compared to the first three. This Jolly Scot coats your tongue with a sweet elixir and just a light brush of hops. Trail Blazing Brown (5.0 ABV/ 30 IBU) The Trail Blazer is an organic beer from ABC, that is darker but with similar orange-reddish brown tones of the Scot. The aroma is strong and woodsy, with malt and sap notes and a roasted palate that builds to a malted finish. Hoppy Trails IPA (6.2 ABV/63 IBU) Just a bit more golden than the Mountain Lager but with barrels more taste. Hoppy Trails comes with a strong floral aroma that really makes “bouquet” an apt aromatic descriptor. Similarly, the taste starts floral, but then builds hoppy to a finish that has a bit of a bite, but is not bitter. Susquehanna Stout (5.0 ABV/18 IBU) Dark roasty brown color with lacing that lasted. This is a take on an Irish Dry Stout, and this varietal tastes exactly like it smells: of roasted chocolate malts. Very good if you like a smooth, roasted flavor. Celtic Knot Irish Red (4.8 ABV/25 IBU) Solidly brown with just a hint of those previously mentioned orangey notes, and lacing that coated the glass and refused to dissipate. Not as much aroma here as the previous few, but what there is, is malted. The taste is well rounded, starting soft, building and then leveling back off with an almond/bready start that turns malty. Pennybacker Porter (5.4 ABV/65 IBU)Wasn’t on till 6pm, but we managed to get a small taste. Ted the useful bartender who tolerated all of our questions thinks that this one is smoother than the Susquehanna Stout, and imparts a malted, almost creamy taste. Broad Street Barleywine (10.9 ABV/54 IBU)- Cola colored with that cloying sweet smell you find in imperial beers. Tasted strong and tangy with an anise flavor. Barleywines typically don’t rank very high on Gillian’s list, but Jim liked it. Grinnin’ Grizzly (5.7 ABV/18 IBU) – This one smelled like cinnamon fire, and seeing as it’s a spiced ale, that’s fairly appropriate. Sweeter gingerbread palate, and while we are staying on the spice theme, this one is the color of nutmeg.